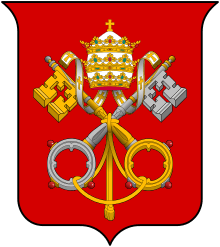 Pope Eugene III (Latin: Eugenius III; ca. 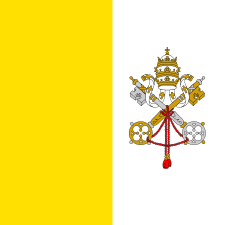 1080 – 8 July 1153), born Pietro dei Paganelli di Montemagno , was Pope from 15 February 1145 to his death in 1153. 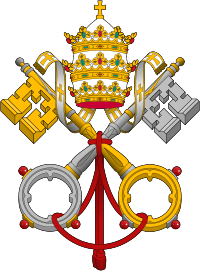 He was the first Cistercian to become Pope. After he became a Cistercian he took the name of "Bernardo" in honor of his friend, Bernard of Clairvaux. Bernardo was born in Pisa. Little is known about his origins and family except that he was son of a certain Godius. From the 16th century he is commonly identified as member of the family of Paganelli di Montemagno, which belonged to the Pisan aristocracy, but this has not been proven and contradicts earlier testimonies that suggest he was a man of rather humble origins. In 1106 he was a canon of the cathedral chapter in Pisa and from 1115 is attested as subdeacon. 1133–1138 he acted as vicedominus of the archdiocese of Pisa. Between May 1134 and February 1137 he was ordained into the priesthood by Pope Innocent II, who resided at that time in Pisa. Under the influence of Bernard of Clairvaux he entered the Cistercian Order in the monastery of Clairvaux in 1138. A year later he returned to Italy as leader of the Cistercian community in Scandriglia. In Autumn 1140, Pope Innocent II named him abbot of the monastery of S. Anastasio alle Tre Fontane outside Rome. Some chronicles indicate that he was also elevated to the College of Cardinals, but these testimonies probably resulted from a confusion because Bernardo is not attested as cardinal in any document and from the letter of Bernard of Clairvaux addressed to the cardinals shortly after his election clearly appears that he was not a cardinal. Bernardo was elected pope in February 1145 and took the pontifical name of "Eugene III". He owed his elevation partly to the fact that no one was eager to accept an office the duties of which were at the time so difficult and dangerous, but chiefly to his being the friend and pupil of Bernard of Clairvaux, the most influential ecclesiastic of the Western Church and a strong assertor of the pope's temporal authority. The choice did not have the approval of Bernard, however, who remonstrated against the election on account of the "innocence and simplicity" of Eugene III. But after the choice was made, he took advantage of the qualities in Eugene III which he objected to, so as to virtually rule in his name. 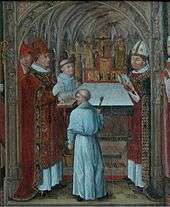 The episcopal consecration of Pope Eugene III. Eugene III held synods in northern Europe at Paris, Rheims, and Trier in 1147 and 1149 that were devoted to the reform of clerical life. He also considered and approved the works of Hildegard of Bingen. In 1149, Eugene III returned to Italy and took up his residence at Viterbo. He fled to Prince Ptolemy's fortress in Tusculum on 8 April and remained there, where he met the returning Crusader king Louis VII of France and his wife Eleanor of Aquitaine. He stayed there until 7 November. In 1150, through the aid of the King of Sicily, he was again able to enter Rome, but the jealousy of the republicans soon compelled him to retire. The death of Pope Eugene III. The Emperor Frederick I Barbarossa had promised to aid him against his revolted subjects, but the death of Eugene III at Tivoli, on 8 July 1153, prevented the fulfillment of the engagement. Though the citizens of Rome were jealous of the efforts of Eugene III to assert his temporal authority, they were always ready to recognize him as their spiritual lord. Besides that, they deeply reverenced his personal character. Accordingly, he was buried in the Vatican with every mark of respect, and his tomb soon acquired an extraordinary fame for miraculous cures. The people of Rome were quick to recognize Eugene III as a pious figure who was meek and spiritual. His tomb acquired considerable fame due to the miracle purported to have occurred there and his cause for sainthood commenced. Pope Pius IX beatified him in 1872. ↑ "Blessed Eugene III". Retrieved 9 July 2015. Original text from the 9th edition (1879) of an unnamed encyclopedia. Original referred to him as Eugene – modified to match spelling on Popes list. Please update article as needed. Saint Bernard of Clairvaux, On Consideration, (addressed to Pope Eugene III), George Lewis, trans., Oxford, Clarendon Press, 1908.